The Akis Studios are situated in a relaxing, quiet area at the entrance of Parga. This very well kept accommodation is a mere 6 or 7 minute walk from Town Beach, a fantastic beach for families and couples, and all of Pargas many amenities. These comfortable, good quality and very well looked after studios and one bedroom apartments all have air-conditioning (payable locally), safety deposit boxes (payable locally) and fully equipped kitchenettes. The ground floor studios have a terrace. All other studios & one bedroom apartments have balconies. 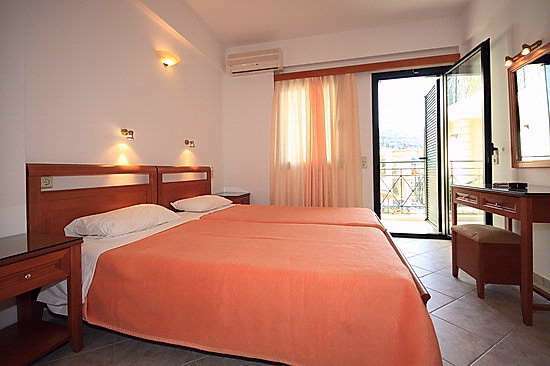 Studios for 2 persons are pleasantly furnished with a twin bed or double beds, a kitchen corner and a private shower. The one bedroom apartments up to 3 persons. consist of one bedroom with a twin or a double bed, separate kitchenette with a sofa bed to accommodate a third person. For those guests who want to relax around the accommodation, there is a medium sized swimming pool within the grounds in front of the two buildings with sunbeds. There is also a parking area for a few cars next to the accommodation.